The exotic car segment in Europe slightly recovers from its slowdown in the first half, as Q3 sales were down 4%, lifting the year-to-date score to -11%. Much of the lost volume is due to the changeover from the Ferrari 458 Italia to the new Ferrari 488 GTB, which is happening very slowly. The outgoing 458 is already down 28%, losing 326 units of volume, while the 488 is off to a slow start, at 62 units this quarter. That means the Bentley Continental GT is able to take undisputed control of the segment, with sales down only 2% so far this year. The Lamborghini Huracan is now firmly into third place, and is getting closer to its main Ferrari rival than the Gallardo has ever managed. 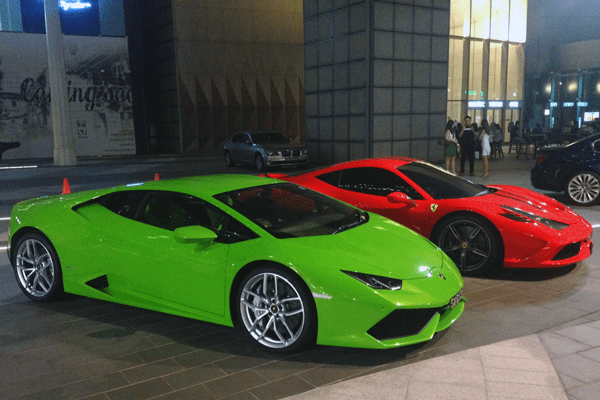 This is of course partially due to the changeover at Ferrari, but also thanks to ever-increasing popularity of the Lambo, as the typical edgy and polarizing Lamborghini design of the Gallardo is softened with the Huracan. Bugatti also had an impressive quarter, selling 8 units in Europe and bringing its year-to-date total to 11 the final year of the Veyron. 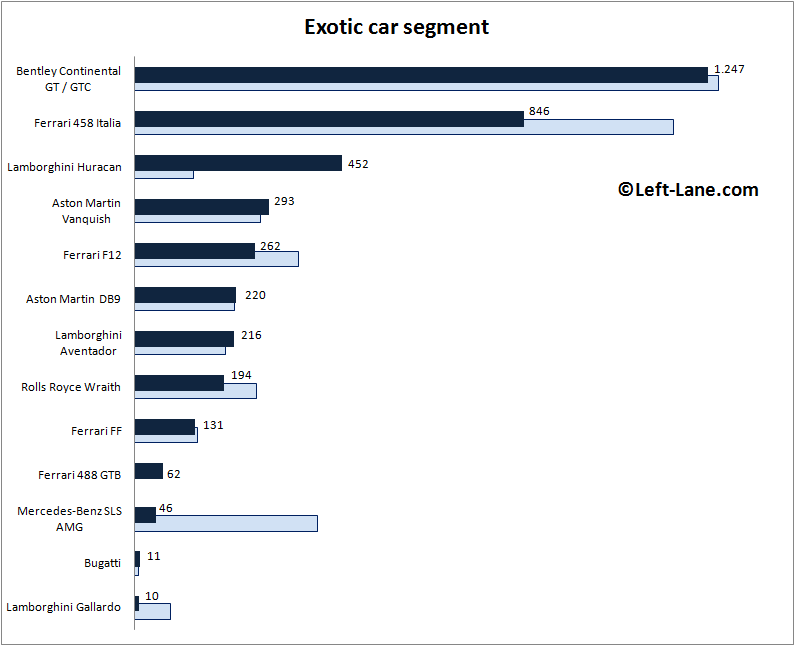 Also check out the 2015-H1 exotic car segment in the United States. 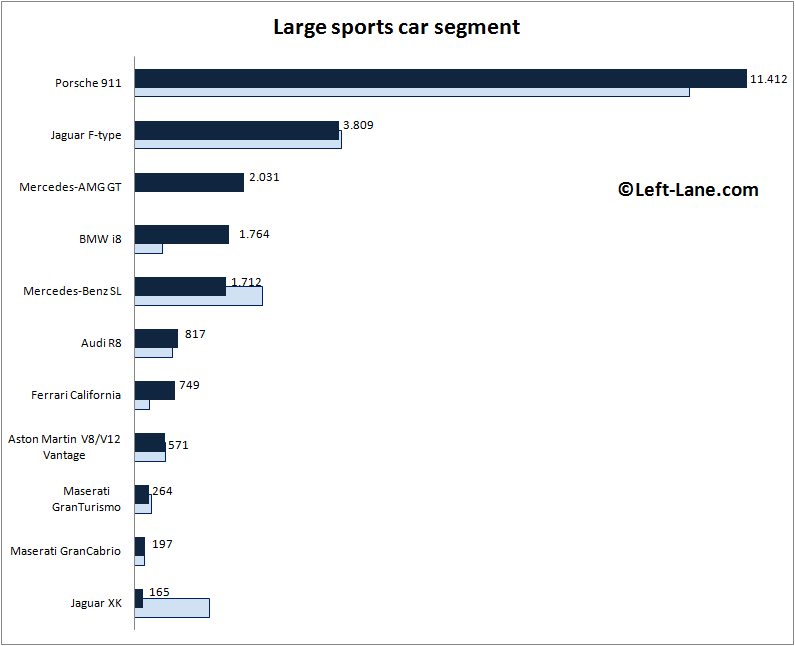 The large sports car segment in Europe keeps growing at 14% this year, helped by the introduction of the Mercedes-AMG GT, the continued impressive performance of the BMW i8 and the facelift of the Ferrari California. All these new and fresh products can’t keep the Porsche 911 from its throne, as it also adds 10% to its volume of last year, and still controls almost half of the segment sales. The #2 Jaguar F-Type is stable and so far unthreatened by the AMG GT. The Mercedes-Benz SL is, but that model will receive yet another facelift to keep it fresh as the new generation Audi R8 is ready to storm up the charts in 2016. 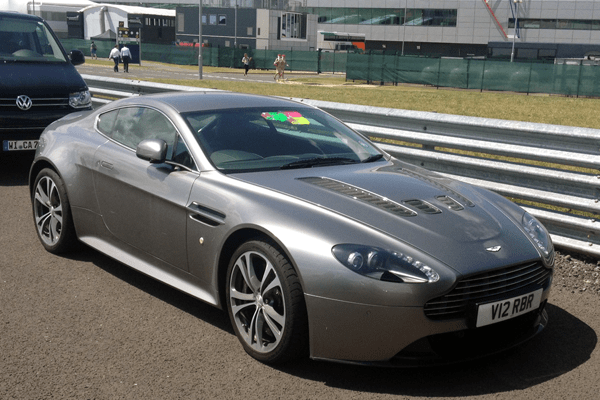 The Aston Martin V8/V12 Vantage is surprisingly stable for a 10-year old model in this segment, especially considering the Maserati GranTurismo is “only” 8 years old and down 15% this year. Also check out the 2015-H1 large sportscar segment in the United States. 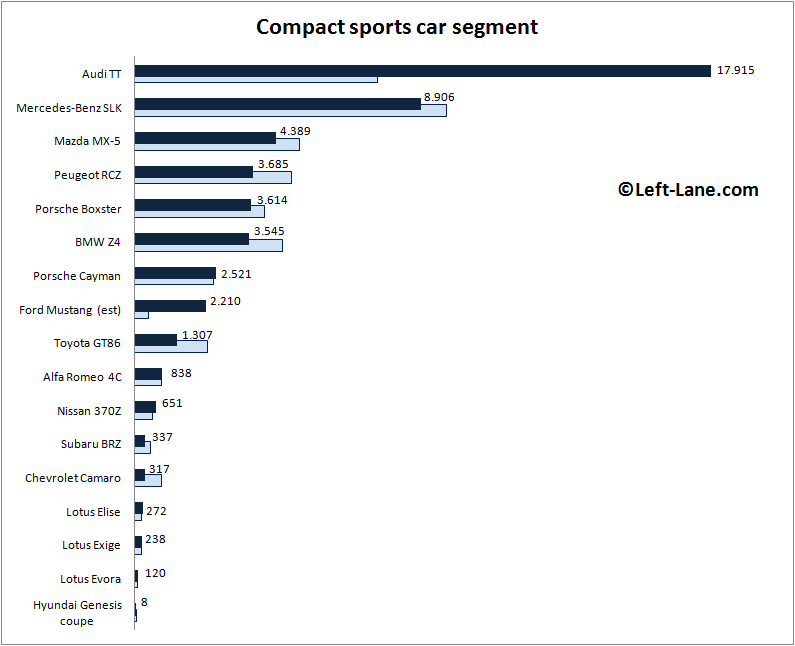 The compact sports car segment takes off in Q3 at +59% for the quarter and +15% year-to-date after a flat first half. 86% of the quarterly increase comes from the new third generation Audi TT, the firm leader of the segment with double the sales of its nearest challenger Mercedes-Benz SLK, last year’s leader. The new fourth generation Mazda MX-5 is boosted 41% in Q3 to even outsell the SLK, but year-to-date the MX-5 is still down 14%, although it moved from 6th place in the first half to the #3 spot, which it will hold on to till the end of the year. The Peugeot RCZ has swapped places with the Porsche Boxster once again, while the Porsche Cayman outsells the BMW Z4 in the third quarter. We welcome the new generation Ford Mustang to the ranking, although the data may not be 100% accurate, as we get them from Ford directly, who rounds off their monthly sales to the nearest 100. Still, almost 2.000 sales in Q3 are not bad for the American muscle car that has finally crossed the Atlantic in an official way. The effect on the Camaro is immediately evident. Also check out the 2015-H1 small sportscar segment in the United States and the 2015-H1 US small premium sportscar segment.